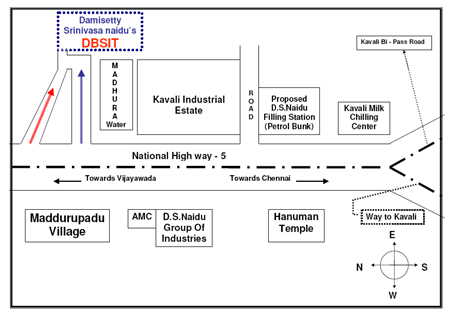 Damisetty Srinivasa Naidu’s DBSIT is located in the NH-5,INDUSTRIAL ESTATE,D.S.Naidu Nagar,Maddurupadu Village, Kavali, SPSR Nellore district. 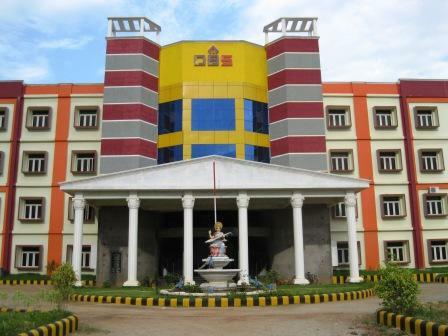 The campus is about 55 kms North side of Nellore and 60 kms South side of Ongole. Extremely well-connected to Kavali, Nellore, Ongole the Institute is just 6 kms from the nearest railway station at Kavali on the Vijayawada Chennai line. The lush green DBSIT campus spreads across 25 acres. College infrastructure includes well-equipped departmental blocks, an administrative complex, lecture halls, seminar rooms, the central library, laboratories, workshops, hostels, dining halls, staff quarters, sports facilities and a state-of-the-art auditorium.